Grab your wakeboard, skate, surf or anything else you can get on the water. Thanks to exclusive tow-focused features like Ski Mode, a Ski Pylon, and Board Rack, there's no other watercraft you'll want to be towed behind. -This exclusive feature allows riders to select preprogrammed acceleration and speed profiles for repeated and precisely controlled ski and wakeboard launches, plus the benefit of 2 other riding modes (Sport and ECO). -Enjoy an higher tow point to tow your friends with ease. Features spotter handgrips and rope storage. -This removable Board Rack comes standard, so you can carry your board on the side of your watercraft to help you get to your favorite riding spot with ease. -This innovative material reduces the weight of the watercraft to deliver peak performance even with smaller engines and making it easy to tow with most sedans. Plus, the color-in molding makes it more scratch-resistant than fiberglass. -Makes it easy to get back on the watercraft after having fun in the water. Features a fold-down design. 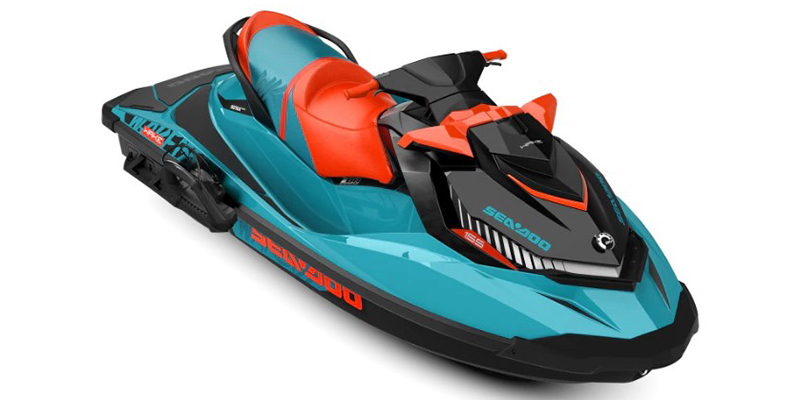 -Recognized by the U.S. Coast Guard for improving boat safety since 2009 and now in its third generation, the Sea-Doo exclusive iBR (Intelligent Brake and Reverse) system allows you to stop up to 160 feet (48 m)* sooner than watercraft not using a brake. With both hands on the handlebars, riders can engage forward, neutral, and reverse for stable, worry-free maneuvering at low speeds. -This technology prevents corrosive saltwater and damaging debris from entering the engine, for increased reliability and peace of mind.